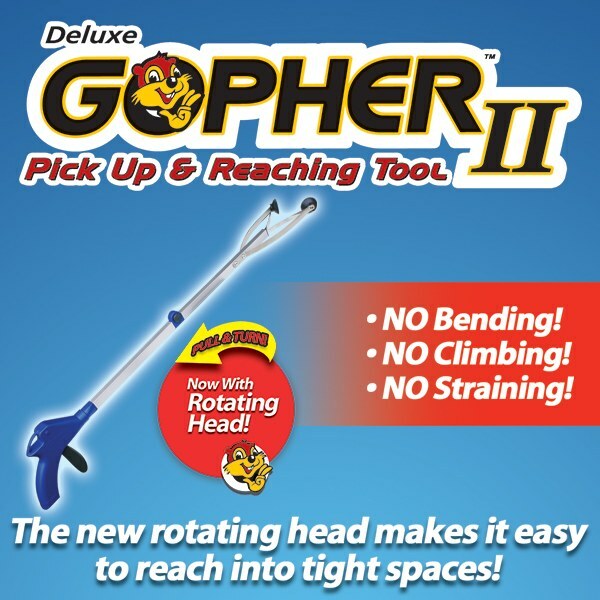 The Gopher Grabber as seen on TV is the handy helper that reaches so you don&apos;t have to. Use it for reaching up high, or for picking up down low. In the laundry room it&apos;s the best, it&apos;ll get that odd sock in the impossible to reach area. Any object big or small, it grabs, fits and lifts them all. If you cant get to it then the Gopher is great! Grip and lift in one easy motion. With just one finger the Gopher 2 locks on so you can pick up, take out and put back without any effort. The secret is the suction action combined with the easy locking handle that gives you the power to reach, without stretching or bending. Under the bed or under the sink just squeeze and retrieve with one simple step. It picks up what you dont want to touch. It&apos;s much safer than a chair. Use it outside in the yard; it takes the bending and reaching out of your daily chores. Love it!!! I have problems bending over to pick stuff up off floor and it helps great. Love this. Works well in right spaces too. Works like a charm!! Picks up pills, pill bottles, jar lids, & even tunes my radio. I&apos;ve lost my right hand, so Gopher II helps me get the most out of the one I have.